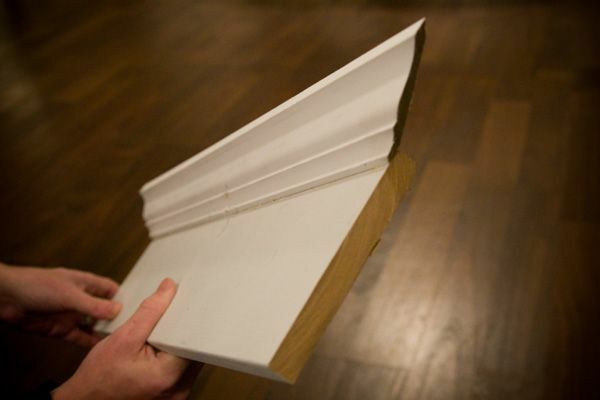 It’s just 1″x6″ pre-primed MDF, some 3″ crown molding, and some small, wood decorative trim moulding. 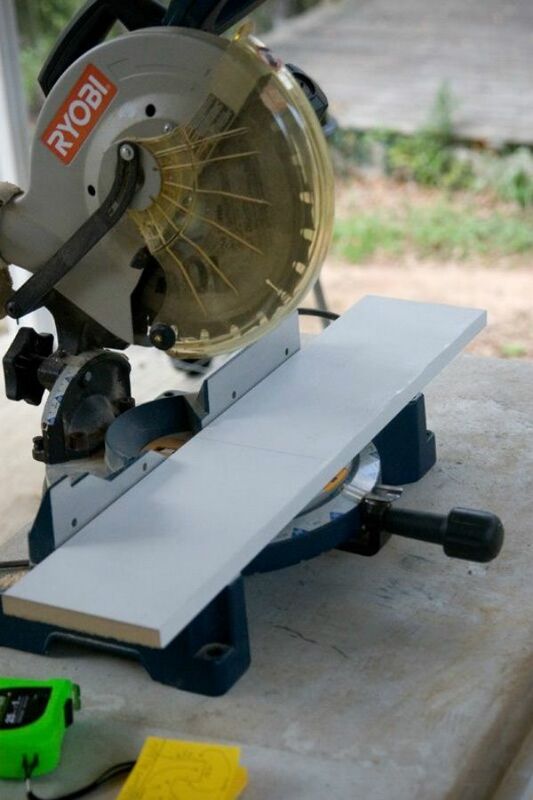 I used our Ryobi compound miter saw to make all the cuts. It was the cheapest one in the store, but it always seems to get the job done! 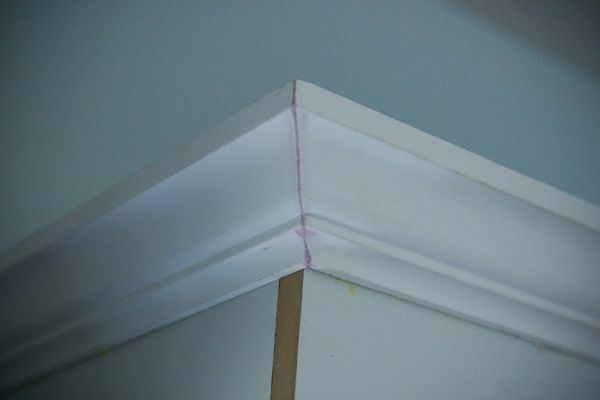 All of the cuts had to be made holding the molding at an angle. 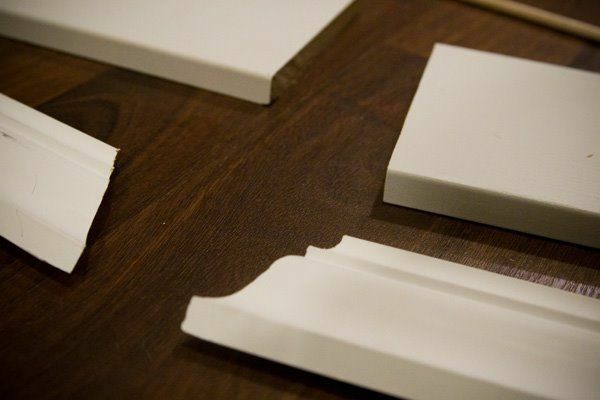 It took me a minute (and a few pieces of molding!) to figure that out! 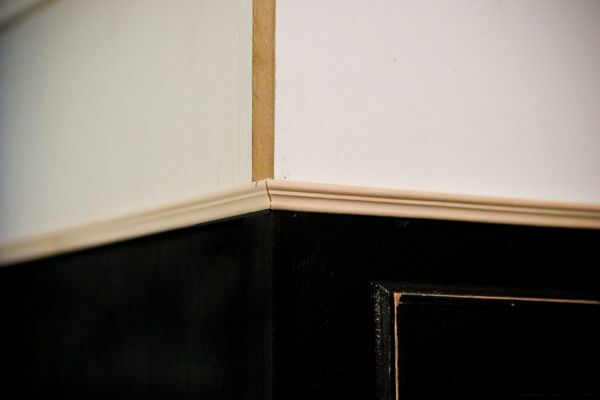 After that, I used some small, decorative wood trim to hide the seam between the cabinet and the 1″x6″. 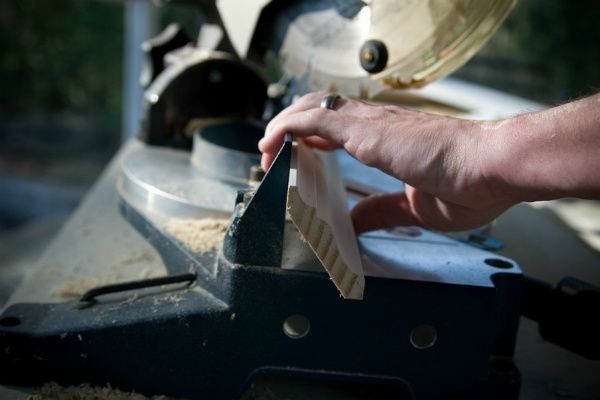 The miters are a lot easier to cut on these little guys, because the trim sits flush to the cabinet. It doesn’t stick out at a 45 degree angle like the crown does. 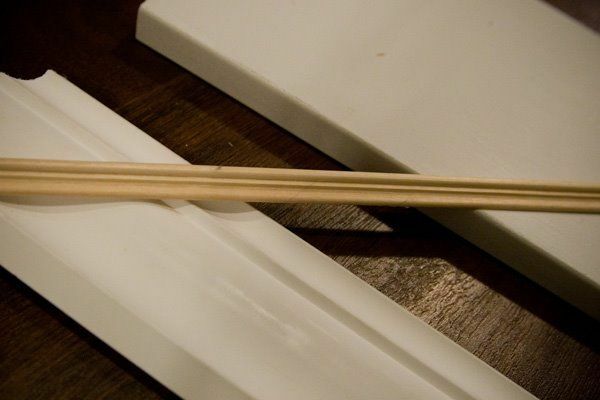 For more info on the kitchen- check out the “Our House” tab at the top of our blog! If you already know the link party drill, feel free to scroll on down and link away! 1. Scroll down this page until you see the “add your link” button. Click it, and create a super-descriptive name for your link. Something like, “How To Make Carrot Cake”, or “Spring Wreath Tutorial”. That’ll make it easier for folks to browse through all the links. 2. Make sure you link directly to the How-To post you’d like to share– not to the home page of your blog. 3. We’d love it if you’d slap our How To’s Day button at the end of your how-to post on your blog. Just copy and paste the code in the box below into the html part of your post, and voila! Thank you! Thanks for partyin’ with us, and hope you have a Happy To’sday! I’ve been following for several months now, and you two continue to amaze me with your creativity and mad skills. I love the soft colors you use in your current kitchen. 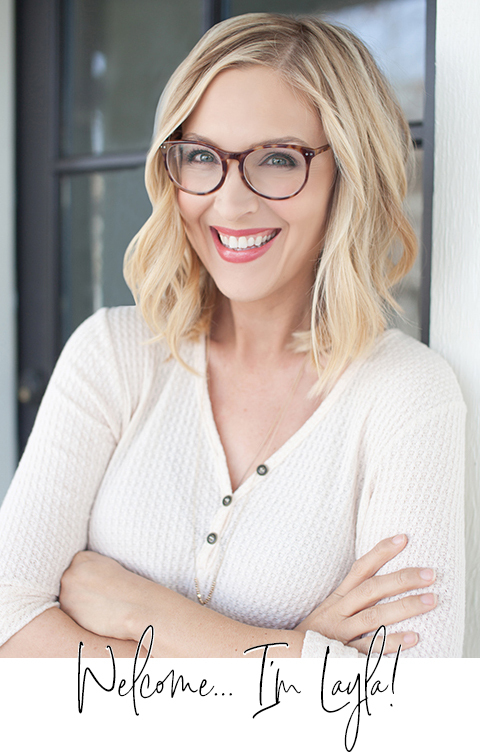 Can’t wait to hear more about your show with HGTV! I love how you made them look custom! Such a difference. Thanks for the great link party too! 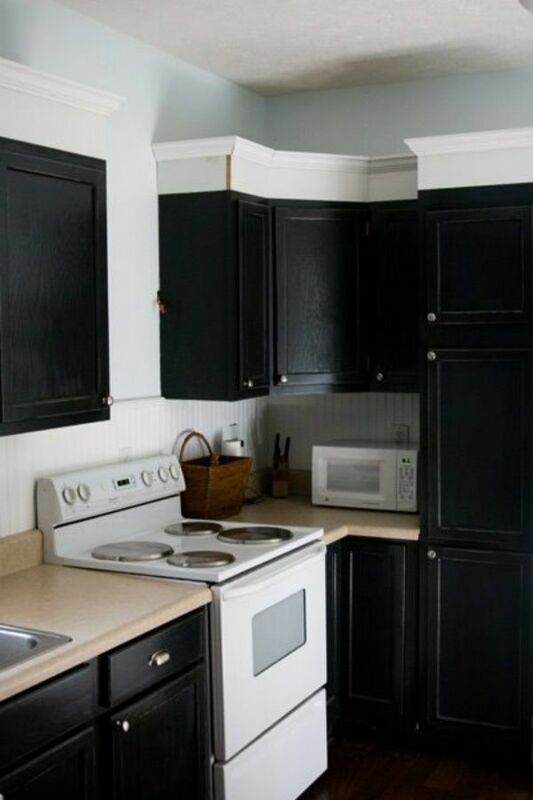 What a great way to add height and interest to basic cabinets! If only we didn’t have a soffet above ours…I really want to rip it out but I’m worried about what is lurking underneath. I love it! It’s like adding accessories to an outfit – totally makes the cabinets! Now tell the truth, do you ever hide, I mean store anything up there? Happy Anniversary Guys….I was a June bride myself (June 16)….glad you’re taking out sometime to celebrate…..Enjoy !!!! Thanks Kathy! Our anniversary was the 25th and my birthday is today! 🙂 Thanks for the kind words! 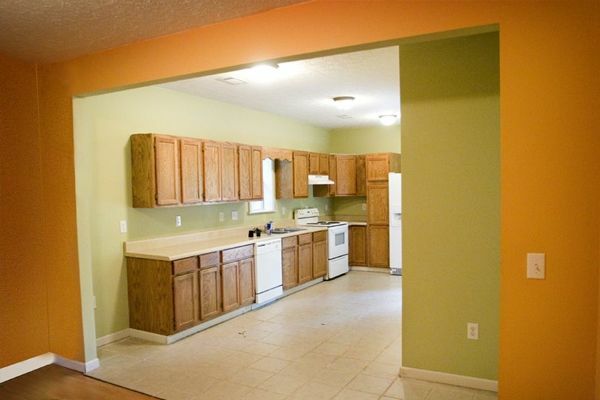 We are almost done with our kitchen… this is the one project that we’ve put off until last! Thanks so much, now we know how to do it!! Happy Birthday Kevin, it’s my birthday too! My 5 year anniversary is July 1st so we will be celebrating soon also! Happy Anniverary and Happy Birthday! Thanks so much for hosting! Thank you Amanda! Glad you stopped by today! You two are so clever! Thanks for showing me something I can keep on file for after we move! I’ve always LOVED your kitchen and every time I see it I want to bust out the screwdriver and take a few of the top doors off my upper cabinets 🙂 Then I get sceered 🙂 Maybe I should just DO IT already! 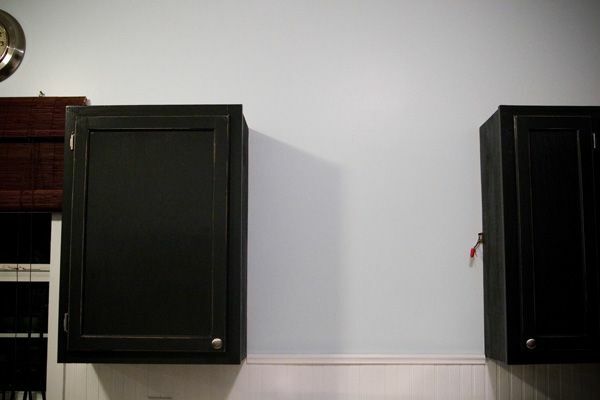 These are the exact cabinets we have, and I’ve been dying to paint them. but my husband is worried they’ll chip too easily. Can you tell me what products/techniques you used, and if you’re having chipping issues? They look awesome to me, and it’s just the look I’m going for 🙂 Thank you!!! Even when you and your bride are in your eighties you will remain vibrant and full of life because you are young at heart. Happy Anniversary to the DIY and Blogdom’s sweetest couple! We wish you a lifetime of love, friendship, passion and joy. 1. 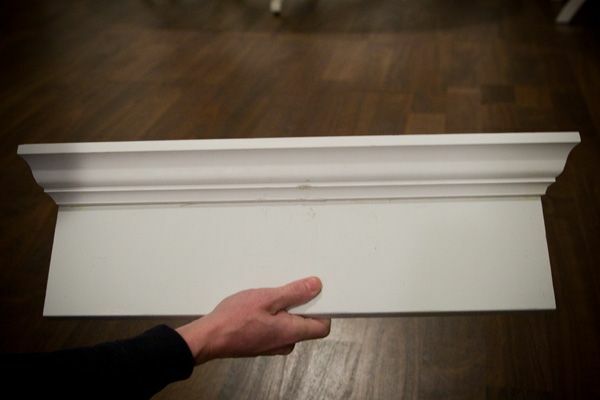 My wall & cabinets are so old & crooked that if I’d just glued ’em…the moulding probably would’a snapped off on one end and slapped me in the face. 2. I actually do grab a hold of it as I swing myself up onto the counter to do a little “above cabinet” storing & redecorating. Happy Belated Anniversary Birthday Day! Thanks for hosting! 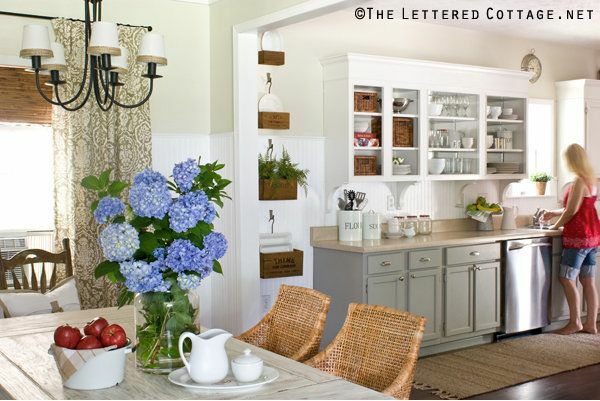 I’ve always admired your cabinet redo…if only I could convince my hubby to tackle it here!! I absolutely LOVE your kitchen!! 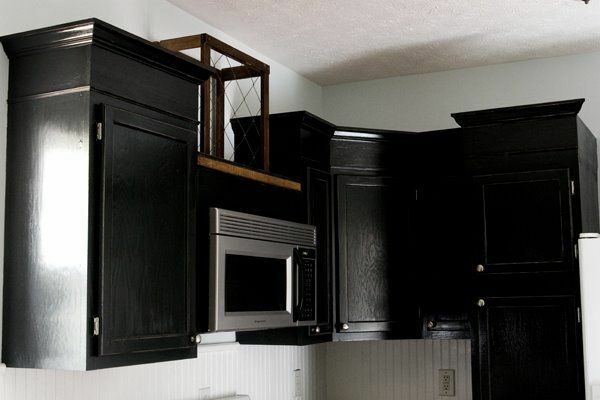 I totally want to do this to my cabinets! Storage is at a premium in my house, and I’m thinking I could use that 6 inches to store a lot of stuff, too, like Christmas decorations or something! Maybe this will be a good project for my old farmhouse kitchen! I love love love this! In fact, it inspired me to create the look I did in my kitchen. I found your blog a few weeks before we bought our current house and I immediately knew what I wanted to do with the kitchen, armed with your ideas, ha! Thanks so much for hosting this! My entry wasn’t too detailed since there was only one step, but I’m super excited to be a part of this for the first time! Thanks for hosting it you guys! Your blog rocks! I’ve been a reader for years and even show my friends your stuff when they are at my house! Love it! Great tutorial! I wish we didn’t have the dumb soffet above our cabinets. I’d love to extend them or do something pretty like this! But, it must be there for a reason. I’m guessing heat and a/c to the upstairs. I still love your tips and have it bookmarked for adding interest to bookcases though! thankfully i have a handy dad and he helps me with all this stuff but i need to learn ,so thanks for sharing! he got a bunch of old barnwood yesterday and can’t wait to do something with it!! enjoy the day and thanks for the link party! I LOVE old barn wood! So cool! @Susan, I love that I get to be that dad! In a word: Beautiful! So much prettier in white! Happy Birthday and Happy Anniversary! Thank you for the link party and the inspiration! You guys rock! what will you think of next? who knows, but I know I’ll LOVE IT! Hard to choose between my fav: making a “oh no not those cabinets” kitchen into “Ooo la la I love it’ OR how you made my favorite 1234 PB cabinets. Tough choice. Thank you for always inspiring & having great taste. Now, if I could just get my hubby on board to learn how to build stuff! Other than amazing food that is…..HA! Your creativity inspires. Thank you. Truly. Happy Anniversary! You are so talented, the cabinets look great! Hi- this is off topic (the cabinets look great! )- where did you find your wicker chairs? I love them! Where have all these good ideas been hiding. I’m trying to learn how to Pinterest and it is fantastic. Your blog is so inspiring. I am SO in love with your Blog. Thanks for your sharing your talents and being such an inspiration! Thank you for posting this how-to! I am finally ready to do this to my cabinets (after putting it off since you posted this several years ago!). 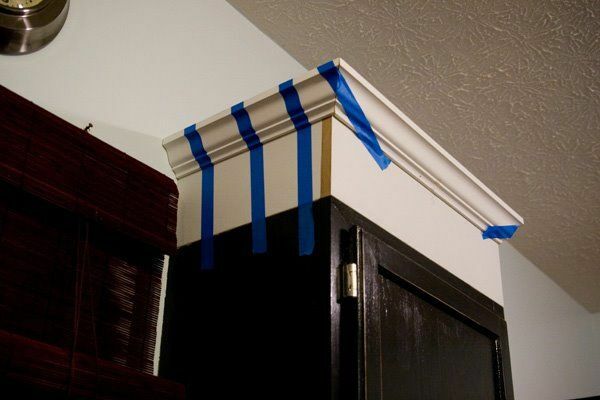 How did you attach the 1×6’s to the cabinets? Did you just glue it or use brackets? Love the idea of adding height to the builder grade cabinets. 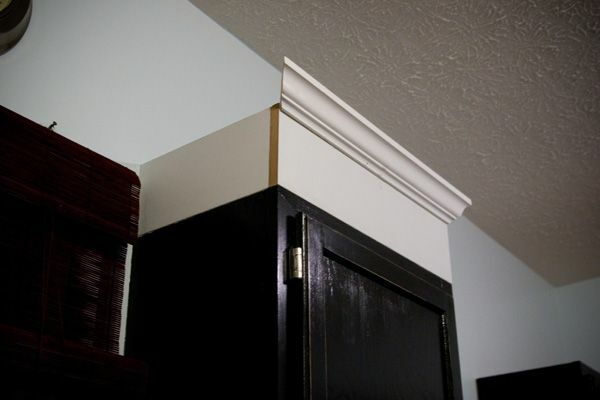 Question: how did you attach the 1 x 6 to the top of the cabinet? Did you use some sort of bracket? Please post or send reply!